FOR DYNAMIC DRYING, CALCINING AND OTHER HEAT TREATMENT OF POWDER. The key to producing uniform, heat processed powders and granules is equal thermal treatment of every particle. 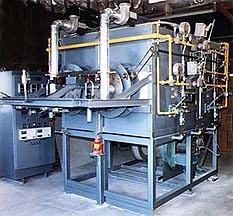 UNIQUE/PERENY Rotary Tube Furnaces are specifically designed for continuous, dynamic drying, decomposition, sintering, calcining and other heat treatment of powders and granules at temperatures up to 3100o F (1700o C). These furnaces are routinely operated in air or other atmospheres to process traditional and advanced materials such as ferrites, titanates, nitrides, metallics, aluminas, carbides, catalysts, reducible oxides and minerals. The Rotary Tube Furnace offers advantages over static or batch processes because material flows freely through a sloping, heated rotating tube where it is tumbled constantly, causing uniform heat treatment of every particle. Both the slope angle and the rotation speed may be varied to provided a wide range of material throughput rates. Indirect heating and multiple temperature zone control provide the means to adjust the temperature profile of the process. Electric or gas fired production and pilot scale models are available with ceramic or metal alloy tubes with atmosphere capability and various materials handling accessories. Reinforced steel case and welded superstructure to form an integral unit with attractive hammertone finish. changeover to other ceramic or metal alloy tubes. Precision tube rotating drive mechanism with adjustable DC motor (0 to 10 RPM) and machined gear drive train with roller bearing guides at both ends of the tube. inclination from 0 to 5 degrees above horizontal. Ceramic furnace lining rated up to 3200o F backed with energy efficient, graded multilayer insulation. Heating components amply rated for maximum heat transfer, temperature uniformity and service life. Programmable, microprocessor based mulitple temperature zone controls with overtemperature protection. meters, lights, relays, fuses and other UL/CSA listed components. Comprehensive operation and maintenance instruction manuals. Custom built units designed to meet specific work requirements. Electric or gas heated models rated for available service. Custom ceramic or metal alloy tubes with internal flights. Auxillary ports, air circulation and accelerated cooling systems. Atmosphere gas-tight construction and burn-off provisions. Neutral or reducing atmosphere muffle-retorts with various seals. Atmosphere gas mixing and flow control panels. Adjustable automatic material feeder with required capacity hopper. Double wall stainless steel material collection cooling hopper with interlocked discharge valves. Purchaser selected control instrumentation packages and panels. Computerized process control systems and data recorders. Factory installation, startup or complete turnkey service. Drying, sintering, calcining, minerals, synthetics, ferrites, titanates, nitrides, alumina, silica, carbon catalysts, absorbants, reducible oxides. Adequate building and foundation with clear access to install equipment acquired. Necessary utilities to operate furnace. Installation of equipment in accordance with rating plates, instruction manuals and applicable codes. Exhaust hoods, ducts, ventilation safeguards, penetrations and interconnections as may be required by codes or insurers.